A Retrospect In Death is a story about discovery. You think you know yourself? Perhaps you only think you do. On the other side of the Great Divide, the narrator, who remains nameless throughout, encounters his higher self—the part of him that is immortal and is connected to the creator—and learns (much to his chagrin) that he must return to the lifecycle. But first he must be “debriefed” by his higher self, and so they set about discussing the man’s previous life—in reverse chronological order: knowing the end but retracing the journey, searching for the breadcrumbs left along the way. Do those closest to us know us better than we know ourselves; or do they, as we often insist, know jack? Consider that only in death can you really know, and understand, who and why you are—or were. And then ask yourself: At that point, is it too late? Does it even matter? I exhaled, fought to draw yet another breath – one more in a lifetime of breaths – heard my own death rattle, and followed the light. Muted voices, although the words meant nothing to me, and the sound of someone sobbing thrummed softly in my ears. A hand on top of mine – warm, soft, delicate… connecting me. Feminine. A woman’s hand. Someone I knew. Who? The light darkled to a black blacker than the blackest night, and the voices and sobbing faded. Disconnecting, I heard nothing, not even the ringing in my ears that had become familiar to me in my old age as my blood pressure inched ever upward. I might as well have been deaf. I had conquered the Great Divide. A general feeling of indifference, which I’d associated with the acedia others had come to associate with me while I lived, washed over me. In living, I had feared death; yet in dying, despite the crushing weight of far too many regrets, which had become a sort of leitmotif in what had become my anything but Wagnerian life, I feared I hadn’t lived enough. In death, I was relieved to have left behind the hardship, to no longer hear the rhythm of my heart counting down its finite number of beats, to feel the burn of my blood pushed, seemingly against its will, through plaque-hardened veins. 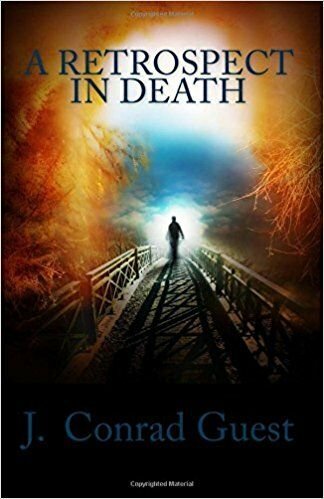 “Introspective, like a personal remembrance of life, this book is more than diary or autobiography, but less than truth perhaps because it’s viewed entirely through the eyes of the (dead) protagonist. Slowly working towards the unseen facts of his character’s past. A Retrospective In Death is a languid, oddly compelling tale, evoking an era with a wealth of intricate detail, creating a memorable yet achingly ordinary man, and searching for meaning and purpose in it all.